Back in August I attended an event for The Body Shop where we all received an amazing goodie bag full of lot's of products. One of the products was the All-In-One Instablur*primer for the face. As I suffer with oily skin, I'm forever trying to find products that will help keep my makeup in place and also disguise the pores that I have, although the size of my pores have reduced massively over the past ten months, which is pretty much due to my skincare routine. I've tried tons of primers, some are great and some are just awful. My current primer is Benefits PoreFessional, which unless you've been living under a rock for the past few years, you'll know that this is one of the most popular primers on the market, but at £24.50, it's kind of expensive. 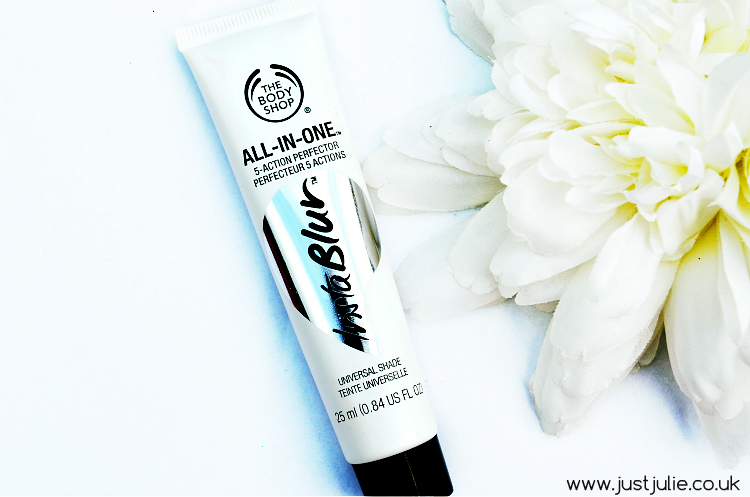 The Body Shop All-In-One Instablur has a similar silicone feeling that Benefits PoreFessional has. It promises to have five actions, those being 12 hour shine control, pore smoothing, hides blemishes, evens out the complexion and extending the wear time of your makeup. For starters a small amount goes a long way, seriously you need just a pea size and that's enough to cover half of your face. Like all silicone primers it does feel very velvety on the skin and once absorbed, leaves your skin feeling silky smooth, which is the perfect base for your foundation to literally glide and blend in with ease. This definitely 'blurred' out my pores, and mattifies my skin instantly and continues to control my oil for around about 8 hours before a slight sign of oil starts to appear, which seriously, I can deal with a bit of shine 8 hours later! One thing I do love about this is that my complexion looks so much more even after using this. With makeup on, my skin looks flawless, without makeup it looks a lot smoother and I can actually get away with wearing just concealer on certain areas, which is pretty much unheard of from me. I honestly think the All-In-One Instablur is absolutely amazing! It costs £14, which is a considerable amount cheaper that the PoreFessional and I actually think this is better, as it helps keep my makeup on for longer and doesn't have as much of a silicone feel either. If you suffer with oily skin, have pores or want a primer that will help prolong your makeup then I highly recommend you pick this up as it will change the way your makeup looks and also feels too. Have you used The Body Shop All-In-One Instablur? What is your favourite primer? *PR Sample from an event.